Say it with a Song - Let one of our Heart of Dallas Quartets sing a special Valentine message to your spouse, girlfriend, boyfriend, family member, boss, co-worker or anyone you like! This gift will be a fantastic memory to last a lifetime. Demonstrate your love in a big way in public! Each Singing Valentine comes with 2 songs performed for your loved one/friend. They will also receive a real rose and a designer card with a personal message from you for only $50.00. A special add on package of a heart-shaped box of delicious Godiva chocolates is also available for $15.00 more. 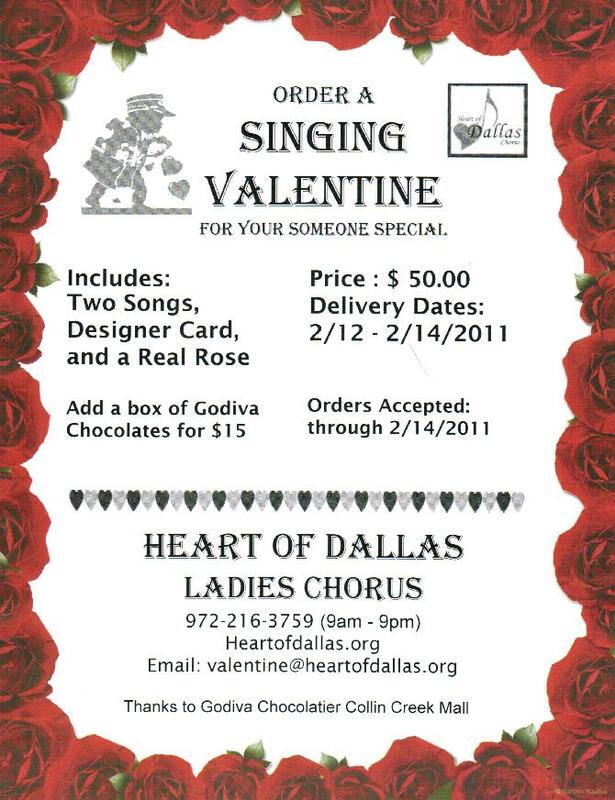 Delivery available in the Dallas Metro area between 10:00 a.m. to 8:00 p.m.
We have delivered Valentine Singing Telegrams to homes, offices, banks, grocery stores, hospitals, nursing homes and more. We would love to sing for you, too!